ShadowHillsExtra! 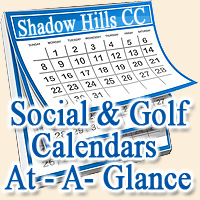 is the Social Community Site for Shadow Hills Country Club. It is a way for us to expand our regular monthly newsletter into a more interactive and mobile feature that allows more information, more pictures, and more interaction. 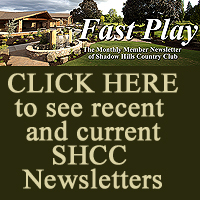 We will be using this site for regular updates about upcoming events, recaps and pictures from recent events, a place to share information on the people and activities that make SHCC a community, as well as a way to get feedback through polls and suggestions from our SHCC members and staff. Please feel free to contact us with ideas for stories, as well as your feedback! Your comments are welcome on any story, but they are moderated, so they may not appear immediately. COMMENTS for stories are more than welcome, but are moderated, so they may not appear immediately. This feature is not meant for suggestions, and we would ask that suggestions be forwarded to either Dave Shelton or The Email for Shadow Hills Extra, Here.